Chris Leggett – I’m still making my way through the [easyazon-link asin=”B0050SYOOA” locale=”us”]Metal Gear Solid HD Collection[/easyazon-link]. Having now finished MGS2 (which I can appreciate more the second time around than when I first played it around 10 years ago), I’m now well into MGS3, which is quickly cementing itself as one of my favorite all-time games. And I’m taking breaks every now and then with some Mark of the Ninja on XBLA. It seems that I’m in the mood for stealth and sneaking these days. Christine Mitchell – I’m still on holiday so I had a good week of gaming. Finished up [easyazon-link asin=”B006WQR3GA” locale=”us”]XCOM: Enemy Unknown[/easyazon-link] this week and now finishing up The Walking Dead too. I also picked up [easyazon-link asin=”B000WPXQSQ” locale=”us”]Bully: Scholarship Edition[/easyazon-link] in the recent sale which has been a good jaunt down memory lane. Nick Santangelo – I finally wrapped up [easyazon-link asin=”B0056WJA30″ locale=”us”]Darksiders II[/easyazon-link] this week. Despite it having the same platforming control issues as the first game, and the story going absolutely nowhere for about 90% of the game, it was pretty damn fun. With that behind me it was on to [easyazon-link asin=”B0050SYV70″ locale=”us”]Far Cry 3[/easyazon-link] on PC the second the credits started rolling on my Xbox. I’m about four hours into Far Cry, and it’s just fantastic so far. I also got in a few hours of [easyazon-link asin=”B0050SYX8W” locale=”us”]Halo 4[/easyazon-link] team slayer here and there. John Laster – Playing through a crazy mix of [easyazon-link asin=”B005C2D2MO” locale=”us”]Dishonored[/easyazon-link], [easyazon-link asin=”B001GIUWX0″ locale=”us”]Mario Kart[/easyazon-link], [easyazon-link asin=”B000FQ9QVI” locale=”us”]Mario Galaxy[/easyazon-link] and [easyazon-link asin=”B000FQBPCQ” locale=”us”]Zelda Twilight Princess[/easyazon-link] before the school grind starts back up for me. Matthew Smail – So this week I’ve been pretty busy. First I finished up the technically impressive, fun and occasionally flat Far Cry 3 before moving on to [easyazon-link asin=”B008277M0Y” locale=”us”]FIFA 2013[/easyazon-link]. On XBLA I’ve been playing a lot of Magic 2013, as well as having finished the whole Walking Dead season 1 in just one sitting. Next up I’m thinking maybe Gotham City Impostors which I’ve had sitting around for some time! Matt Liparota – “Hey, the holidays are over and there are no new games out for a few months,” I thought to myself. “Sounds like the perfect time to dive into my backlog!” Well, that was before I cleaned house, got rid of some old Wii games and cashed them in on Dishonored. For the last three days, when I haven’t been eating, sleeping or working at the day job, I’ve been addicted to a gem of a game that I’m kicking myself for not jumping into when it first released. I’ve been trying to tackle it with the lowest possible chaos, but once in a while I get fed up and just start slashing dudes. 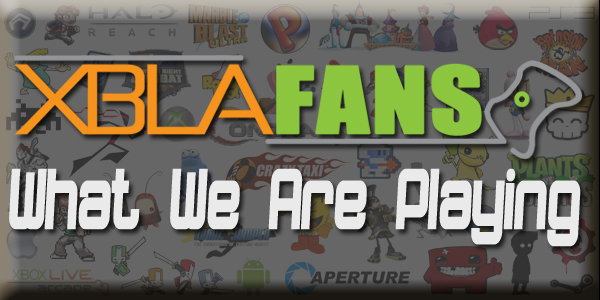 Sorry, [easyazon-link asin=”B0022TNO7S” locale=”us”]Max Payne[/easyazon-link], Darksiders and [easyazon-link asin=”B0053BCMAC” locale=”us”]Paper Mario[/easyazon-link] – you guys are gonna have to wait a little longer. Brandin Tyrrel – I’ve been chipping away at the mountain of games purchased over the holidays. Finally got some time to revisit Dust: An Elysian Tale before being enveloped by the excellent Far Cry 3. Since then, I put the finishing touches on Legend of Grimrock, which is like a shot of straight nostalgia, and I’m currently working on FTL. It’s terrific but heartbreaking when you make it the finish line and everything comes unraveled. Scott Baker – It’s been a busier week for me than I would have liked, but I got a chance to do some 4-player [easyazon-link asin=”B0050SYAQ2″ locale=”us”]Rayman Origins[/easyazon-link] with my wife and some friends. The artistic style makes an extreme first impression, so much that it put one friend off. Luckily, the tight gameplay and frantic teamwork warmed him up to it. When I feel burned out on games, this one reminds me why I play. Also, unlike Super Mario World, I’m actually better at Rayman than my wife.